The decision to return the "Bells of Balangiga" to the Philippines ends a decades-long quest by Manila. F.E. WARREN AIR FORCE BASE, Wyo. — U.S. Defense Secretary Jim Mattis on Wednesday formally returned church bells to the Philippines that were taken as war trophies over a century ago following gruesome clashes, seeking to close a contentious chapter in the two allies' shared history. The decision to return the "Bells of Balangiga" to the Philippines ends a decades-long quest by Manila, including by President Rodrigo Duterte, and is expected to bolster U.S.-Philippines' relations. 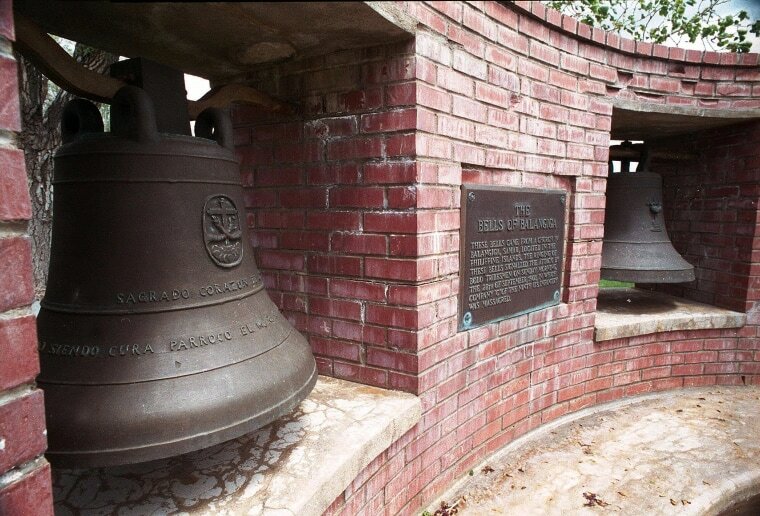 But it has upset some U.S. veterans and Wyoming's delegation to the U.S. Congress, which uniformly opposed returning bells that were a memorial to the 45 U.S. soldiers who were killed during a surprise attack on Sept. 28, 1901, in the central town of Balangiga. Two of the three bells have been on display at F.E. Warren Air Force Base in Wyoming. The third bell is at a U.S. Army museum in South Korea. Mattis, speaking at a ceremony at the air force base attended by the Philippines ambassador to the United States, said the Philippines has proven itself as a great U.S. ally in conflicts over the century since that clash. He said the sacrifices of U.S. forces would not be forgotten. "Today is a time of solemn remembrance as we pay tribute to all those who gave up their lives during the Filipino-American War," it said. Wyoming's Congressional delegation, which did not attend the ceremony, issued a terse statement. "We continue to oppose any efforts by the Administration to move the Bells to the Philippines without the support of Wyoming’s veterans community," Sens. Mike Enzi and John Barrasso and Rep. Liz Cheney told Reuters in a joint statement. All three bells will be restored and handed over to the Philippines as early as December, said Joe Felter, deputy assistant secretary of defense for South and Southeast Asia. The 1901 attack in Balangiga, on the Filipino island of Samar, was seen as perhaps the worst routing of U.S. soldiers since the Battle of Little Bighorn in 1876, also known as Custer's Last Stand. U.S. forces took the bells after a brutal counterattack that killed anywhere from hundreds to thousands of people in the Philippines, historians say. One U.S. general was said to have directed his troops to "make the interior of Samar a howling wilderness." Some Wyoming veterans, like Cheryl Shannon at Veterans of Foreign Wars, said they were fine with the decision to return the bells. "We're tired of it always being an issue," said Shannon, an Iraq war veteran. But Hank Miller, a veteran with the VFW who wanted to keep the bells in Wyoming, said broader support for his position had faded as it became clear Washington would return the bells. "I was advised to 'stop fighting a losing battle' and 'stop beating a dead horse' as the bells were going back," Miller told Reuters.